Ever since moving from Chicago to Brooklyn two weeks ago, my eat/sleep schedule has been so off. I don't know if it's because I'm not currently working a 9-5 job like I was previously, or because we no longer have a bedroom door (cats are so annoying when they stomp on you while you're trying to sleep), or if it's because that's how we do in New York. Anyways, I totally did not just eat my chicken noodle soup dinner at 10:30 pm, no sir, I did not. This seems to be becoming a regular occurance in my apartment lately, and I can't quite decide if I like it or not. I'm sure you're eagerly awaiting this final installment of my three part series. So let's get back to the soup! At this point you're probably wondering if it's even worth it to go through so many steps for something that should be quite simple. But I promise you, it will not disappoint. Plus, it's pretty impressive when you tell people that you made it all from scratch, aside from milling the flour, growing the vegetables, and raising the chicken of course. I like my soup really stuffed to the brim with chunky, noodly goodness, if you prefer yours more soupy, then feel free to decrease the amount of noodles and/or chicken. Heat up a large pot on medium high heat. Add the reserved chicken fat and heat until melted. Add the onions and cook until translucent and slightly browned on the edges, 5-6 minutes. Add the carrots and celery and cook for 1 minute. Add the chicken stock and bring to a boil. Meanwhile, lay the pappardelle flat on a cutting board and cut the noodles into 4 inch pieces. Turn the heat down to medium and add the noodles. Simmer for about 5 minutes. Turn the heat off and add the chicken. Give it a very gentle stir. Since this is chicken that was simmered for 4 hours from making stock, it will be very tender. 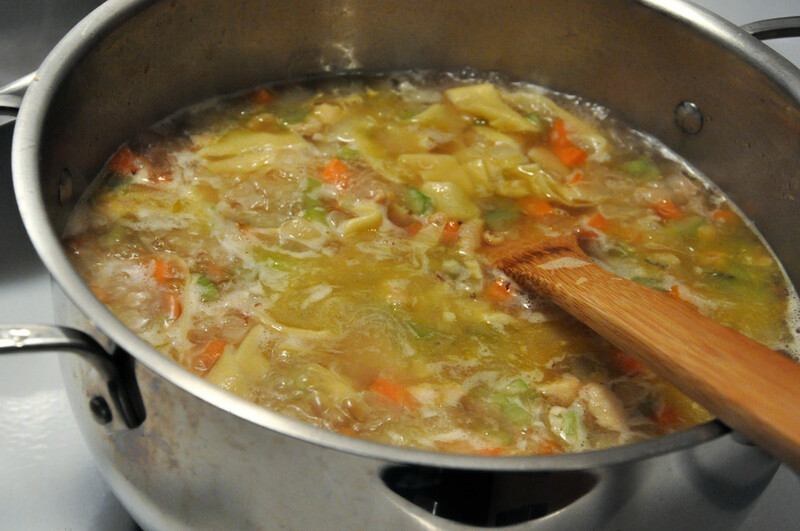 Adding it in while the heat is still on or stirring too vigorously will make it disintegrate into the soup. If you are using some other chicken that has been cooked in a frying pan/baked/etc., you can add it at the same time as the noodles or even before. Salt and pepper to your liking (you shouldn't need much as the broth is intensely flavorful on it's own). Ladle into bowls and enjoy! 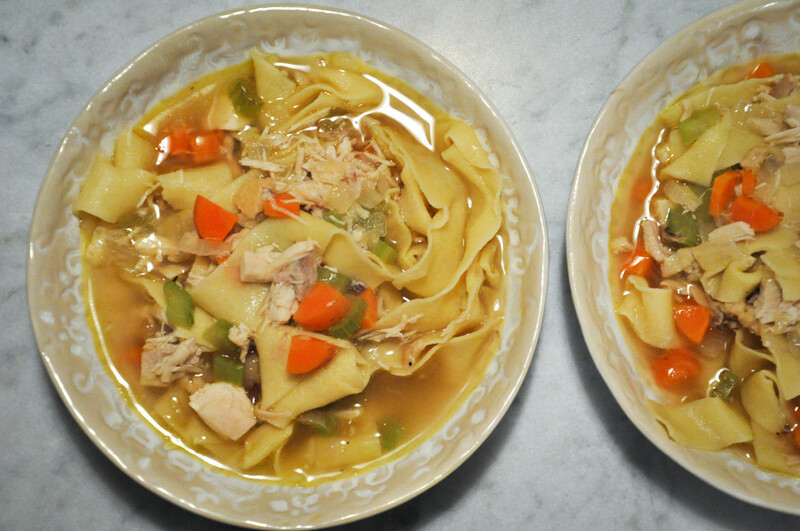 You can easily turn this in to chicken and wild rice soup by subbing the noodles with two cups of cooked wild rice. Or you can turn this into creamy chicken and wild rice soup by increasing the fat to 4 tbsp, adding 4 tbsp flour after cooking the onions, and slowly incorporating the stock as if you were making a bechamel sauce; then at the end, hit it with a few tablespoons of heavy cream.